I made tool aimed at end users. It uses full fledged PTool engine and easy to run on Mac and Linux also (using Wine or WineBottler). * Added battery patch for D3200 v1.01. * Added support for Nikon J1 v1.30 (only text patch). * Added support for Nikon J2 v1.10 (only text patch). * Added support for Nikon J3 v1.10 (only text patch). * Added support for Nikon V1 v1.30 (only text patch). 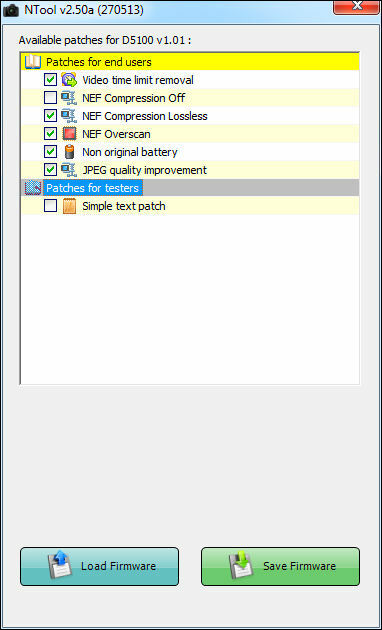 * Added support for Nikon V2 v1.10 (only text patch). * Added support for Nikon S1 v1.10 (only text patch). * Added support and patches for D7000 v1.04. * Added support and patches for D3200 v1.01. * Added patches for D3100 v1.01. * Added patches for D5100 v1.01. * Added support for D600 v1.01 (only text patch). * Added support for D800 v1.02 (only text patch). * Added support for D800E v1.02 (only text patch). * Added support for Nikon J1 v1.20 (only text patch). * Added support for Nikon V1 v1.21 (only text patch). * Added support for D7000 v1.03 (video limit and text patch). * Added support for D3100 v1.01 (video limit and text patch). * Added support for D5100 v1.01 (video limit and text patch). * Added support for J1 v1.11 (only text patch). * Added support for V1 v1.11 (only text patch). P.S. Many patches originally made by S. Pilgrim. It also uses Fujitsu FR LSI that is good known by usage in Pentax and Samsung DSLRs. Looks like it is time to fix few bugs in FR CPU module and make it work on IDA Free. So your thinking of adding Nikon to P-V? Or does this help GH2 as well? I just recently sold my hacked 2011 model GH1 for a Nikon D7000. I am amazed how much the footage from the d7000 looks likes the footage from the hacked GH1. If someone like Vitaliy could hack the Nikon d7000( which also uses I,P and B frames in its video similar to the GH2) that would be really great! Plan to hack Pentax K-5? I made simple working extractor based on ideas of Simeon. So D7000 reads UHS-1 cards... AND... has 2 card slots... all we need to know now is if its ture 8bit or 10bit colour and I am shotgunning the Nikon faster than you can say Nikon! What Nikon would be your current hit list @VK? Good thing I only buy Nikon glass... :D Go for it VITALIY!!!! I just tried your tool on D7000 firmware, but now I have no clue what to do with two bin files and a res file. Maybe it is more than a person like me can handle :) I just hope this development can progress like GH2 hack did. does this firmware hack get rid of the On Screen Display when using hdmi? As a cinema guy, if i could lose all the extra info and just have a clean video signal, i could use an external digital video recorder to bypass the sd cards and lower-quality h.264 codec. ooh, talking about the D7000, here. Thans for all the hard work, Vitaliy! @alcomposer i understand. just throwing that out there. This has to be one of the biggest needs of the pro community, though. Bypass h.264, using a clean hdmi signal to a Atomos or Ki Pro Mini, and you're saving many many filmmakers from having to bump up to a Red Scarlet. OMG!! dreamin of some added magic to the d7000. definitely would contribute some money to that. Even if it doesn't mean a new firmware tool for Nikon cameras, great job Vitaliy on the decrypt! I am in for a donation if we can get D7000 video quality increases - don't own the camera yet but I know the sensor is capable of incredible dynamic range and low light quality. It is a monster for stills and Nikon lenses with aperture rings are cheap. What a year 2012 is going to be! My only missing for d7000 is the lack of ability to change aperture during video recording :| why i can't focus at f1.4 to a close subject and then pass to f11 and have the perfect background in focus? If i can i will help developing plugins.